More effective treatments for solid tumors? Amrik Basran, PhD, CSO of Avacta agreed, saying, “Standard chemotherapy for solid tumors has a poor survival rate. Immunotherapy using PD1 or PD-L1 check point inhibitors offer better survival compared to standard chemotherapy as these allow T cells to recognize and destroy tumor cells. Combination immunotherapies of checkpoint inhibitors mAbs offer even better survival. To substantiate these assertions, Basran presented data on Avacta’s AVA04-251, a PD-L1 binding Affimer which is attached via G4S linkers to a human IGg1 Fc region. This data showed that the molecule is expressed from Expi HEK and CHO cells during transient expression at 250 mg/L and has a half-life of ~120 hours in mouse PK models. 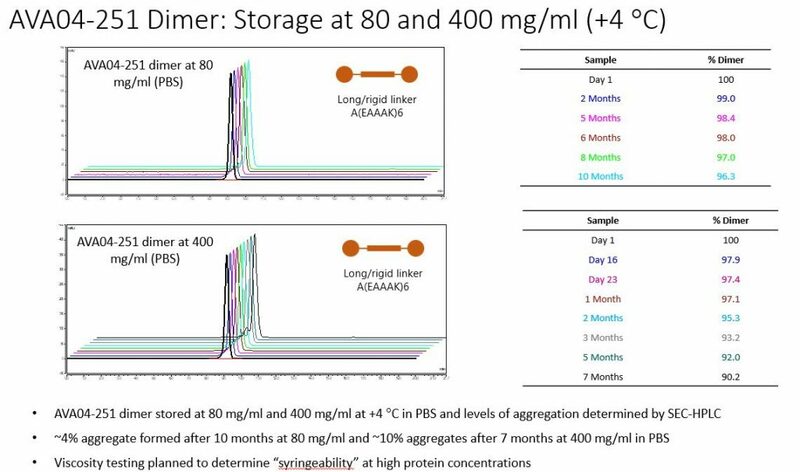 He also demonstrated that the Affimer-Fc could be stored at 200 mg/mL in a simple buffer such as phoshate buffered saline (PBS) at +4°C with ~5% aggregate formed after 7 months as seen in samples analyzed by SEC-HPLC. 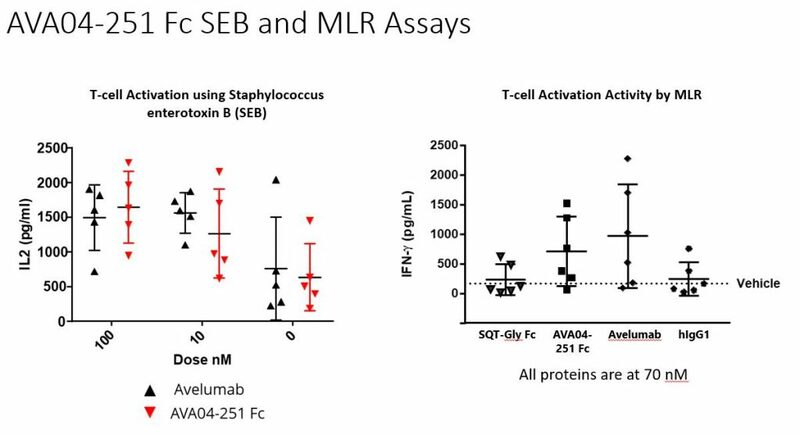 To indicate the in vitro and in vivo effectiveness of AVA04-251, Basran presented preclinical data which showed that AVA04-251 Fc generates T-cell activation comparable to PD-L1 blocking mAb, Avelumab in Staphylococcus enterotoxin B (SEB) and mixed lymphocyte reaction (MLR) assays. He also showed that in a mouse hPD-L1 MC38 model, AVA04-251 Fc (dosed at 10 mg/kg) slowed down tumor growth, which was compareable to the anti-tumor effect seen with PD-L1 binding mAb, Atezolizumab dosed at 5 mg/kg in this mouse model. 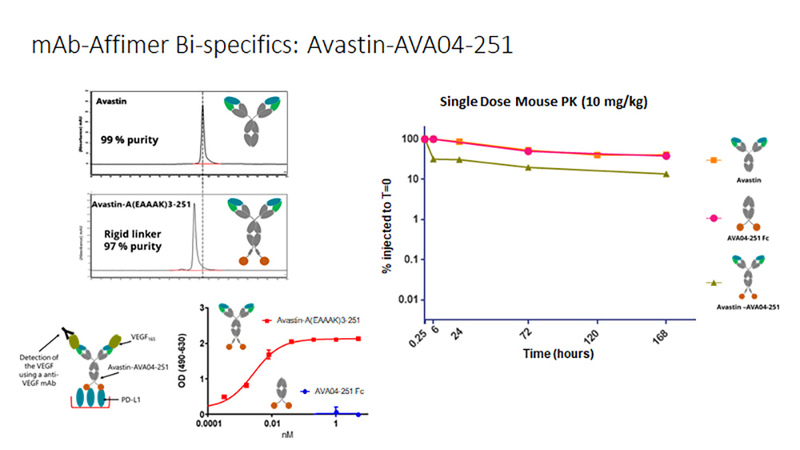 Affimers can also be used as a platform to generate a range of different types of bispecific antibody and antibody mimetics which Basran says “have the potential for better synergistic anti-tumor efficacy.” Basran detailed Avacta’s proof-of-concept molecule Avastin-AVA04-251, which combines the anti-VEGF antibody, Avastin genetically fused to AVA04-251 to the end of the heavy chain. 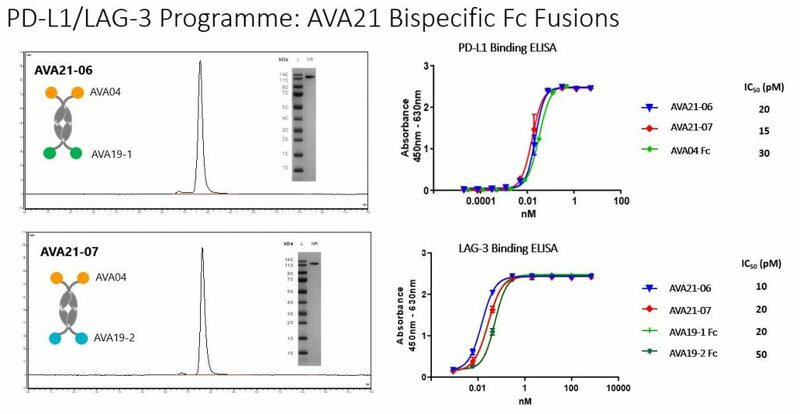 He also discussed AVA21, a bispecific which combines two AVA04 PD-L1 binding Affimers linked to a human IGg Fc region and two other immune checkpoint receptor Affimers (AVA19) for lymphocyte activation gene 3 (LAG-3). “Blocking of LAG-3 on T cells helps to maintain the immune system’s attack and relieves T-cell exhaustion,” Basran states. Avacta’s Affimers are versatile and can also be used as drug conjugates and are currently being assessed for their anti-tumour activity using the tumor microenvironment activate drug conjugate platform (TMAC) in collaboration with scientists at Tufts University. These Affimer TMACs circulate as one molecule, in which the drug conjugate is inactive. When the Affimer binds to tumor cells bearing PD-L1, for example, the Affimer TMAC molecule is delivered into the the tumor microenvironment. Here the drug conjugate comes into contact with enzymes which are expressed in tumors, and the drug is released, allowing tumors to become receptive to immunotherapy, which in this case is delivered by the anti-PD-L1 Affimer. This Affimer targeted approach should also make using these toxic drugs safer and more effective for the patient. Bachovin presented syngeneic mouse data that showed AVA-04 182-Fc (an Fc formatted bivalent Affimer that binds to mouse PD-L1) when dosed at 10 mg/kg and combined with the I-DASH inhibitor in a MB49 mouse urothelial carcinoma model, reduced tumor volume growth over 25 days, with multiple animals having fully regressed tumors by end of the study. He also showed similar tumor reduction and animal survival results from a second study with AVA-04 251-Fc, (an Fc formatted, bivalent Affimer that binds to human PD-L1) when dosed at 10 mg/kg and combined with the I-DASH inhibitor) in a “hPD-L1” MC38 mouse colon adenocarcinoma model with human PD-L1 knock-in over 13 days. 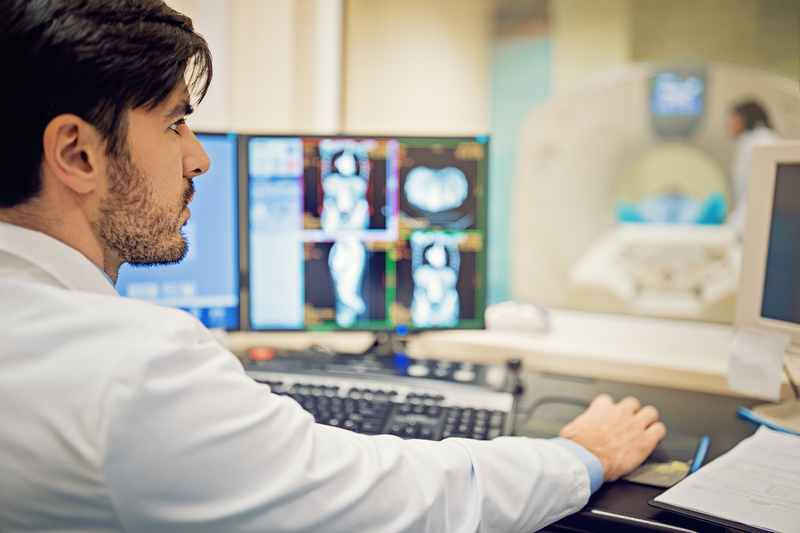 In both studies, the Affimer/I-DASH combination therapy showed similar anti-tumor activity to Avelumab (dosed at 10 mg/kg) and Atezolizumab (dosed at 5 mg/kg) mAb and I-DASH combinations.